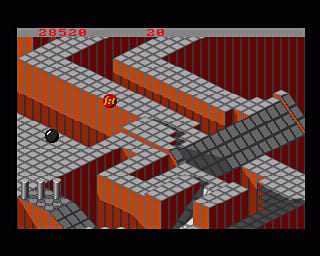 Marble Madness is an isometric platform game in which the player manipulates an onscreen marble from a third-person perspective. The player controls the marble’s movements with a trackball, though most home versions use game controllers with directional pads. The aim of the game is for the player to complete six maze-like, isometric race courses before a set amount of time expires. When a player completes a race, the remaining time is added to the next race’s allotted time. The game also allows two players to compete against each other. Atari Games Corporation,Electronic Arts,Home Data,Inc.,Midway Home Entertainment,Milton Bradley,Mindscape,Tengen,Virgin Games Ltd. Copyright © 2014 - 2019 SocksCap64, All Rights Reserved. Logos, Trademarks, Pictures Belongs To Their Respected Owners. Powered By WordPress. 102 Queries in 0.569 seconds.